Governance of a system involves setting aims and regulating the system that it can achieve its desired form, function and outcomes. The word governance is derived from Latin gubernare and means to steer. It can be both, active or passive. Active governance involves effort and deliberate actions to steer a system into a desirable direction. This involves setting aims as to what should be achieved (i.e. outcome) and how (i.e. regulation). Regulation involves feeding information forward to the system it governs (e.g. setting aims and providing criteria and guidelines for action) and feeding back information on the outcomes achieved (e.g. monitoring, evaluating and rewarding). 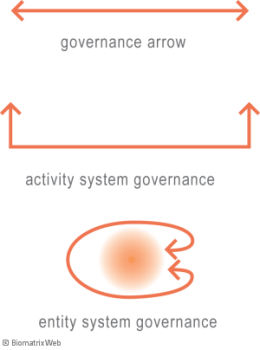 Governance is therefore an activity system. More specifically, it is a sub-activity system of the activity system it governs. Examples are planning and controlling the production of goods and services, supervising learning and disciplining eating. The governance activity system is depicted by an arrow with an arrow tip on both ends to denote feedforward and feedback. It is reshaped into a bracket for activity system governance and rounded for the self-referring governance of an entity system. Passive governance refers to the existing structures of a system (the configuration of the current ethos, aims, process, structure, governance, substance and environment of the system). Unless deliberately changed, these structures perpetuate the current form and function of the system and propel it into a current future. Thus the current configuration of the seven forces represents entrenched governance and resists change (see also dynamics of change in a system). If aims and their regulation are not aligned, regulation tends to overrule aims. For example, if the aim of an organisation is knowledge sharing, but expertise is rewarded, people will be reluctant to share their knowledge. As a (sub)activity system, governance needs to be designed from the aspect of each of the seven forces of system organisation.